El Colectivo de Muralistas David Alfaro Sigueiros is named for the famous Mexican muralist whose work covers a lot of walls in Mexico city. In Estelí, in the northern highlands of Nicaragua, the tradition is kept alive by a talented group of painters working for the Colectivo. The purpose of the work is not just artistic. The murals are used to get across ideas; ideas about health, about education and about the future of the country. 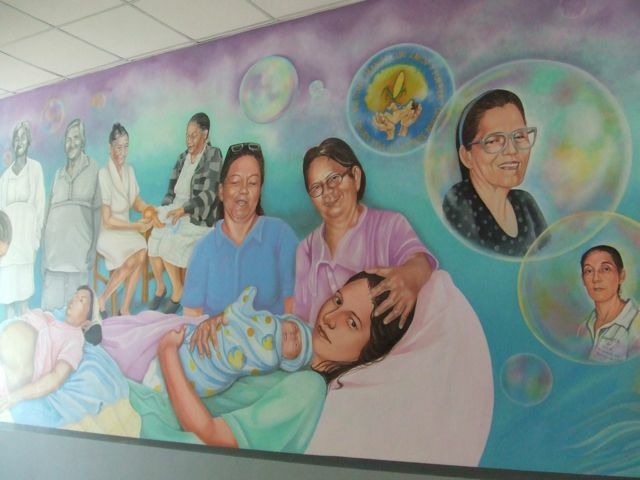 The Muralistas latest project is represented by a set of massive murals at the new health centre just out of town. So far one of the murals is in a large assembly hall, the other in a long corridor running the length of the hospital. 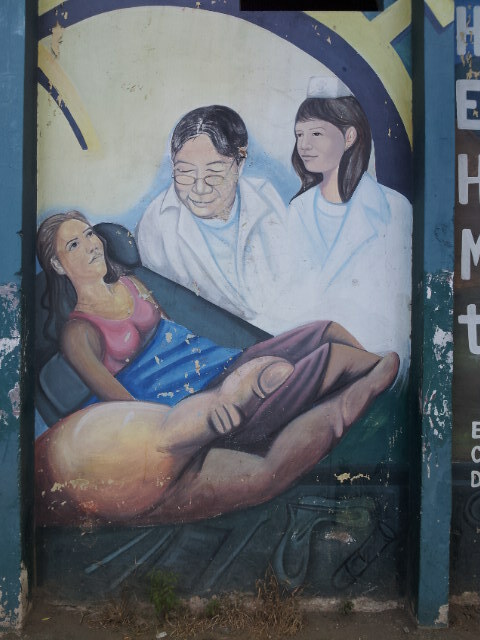 The first celebrates the lives of health workers in Nicaragua, including Mama Licha (whose work is supported by the Fund), alongside pictures of two famous figures from Nicaragua’s revolutionary past – Ernesto Sandino and Estelí’s own poet, Leonel Rugama. There is also a portrait of Hugo Chavez, former president of Venezuela, which donated large sums of money to Nicaragua to finance development. The colours are bright, the painting hard edged and resolute. They will remain this way in the hospital but outside in the streets the colours fade in the sun. Some of the murals are also defaced by graffiti. The artists from the Colectivo from time to time renovate old murals but money is tight now and the renovation of old murals may not be top priority. The Fund continues to provide a small amount of money to the Colectivo for paint supplies.